Kenneth Davitian (born June 19, 1953) is an American actor and comedian, who is best known for his role as Borat's producer Azamat Bagatov in the 2006 comedy film Borat. 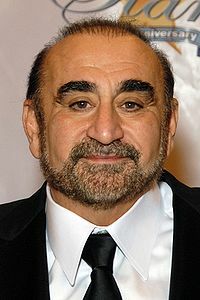 Kenneth Davitian was born on June 19, 1953 to an Armenian-American family in Montebello, California. His father, a Soviet soldier during World War II, was captured by Nazi forces. He was placed at a Armenische Legion camp in Stuttgart. After the end of the war, he emigrated to the United States through the efforts of George Mardikian. Davitian worked in his father's waste management company. He graduated from Whittier College. His teenage idol was Burt Reynolds, who greatly influenced his choice of becoming an actor. Davitian would go on to play in a film which also featured Reynolds, titled Pocket Listing. Davitian is fluent in both Armenian and English. Davitian founded a restaurant in 2003 called The Dip, which was located in Los Angeles. His son Robert used to run his baseball-themed hot dog restaurant The Infield in Sherman Oaks, which boasted a hot dog, conceived by Charlie Sheen, called the "Charlie Sheen Dog with Tiger Blood". 1996 Saved by the Bell: The New Class Gus Episode: "Trash TV"
1997 C-16: FBI Professor David Amir Episode: "The Sandman"
1997 Players Big Oscar Episode: "Contact Sport"
1998 Soldier of Fortune, Inc. Russian Captain Episode: "Double-Edged Sword"
1999 Oh, Grow Up Taxi Driver Episode: "President of the House"
1999 Becker Cab Driver Episode: "Hate Thy Neighbor"
2000 L.A. 7 Alphonse Episode: "House Sitting"
2000 Strong Medicine Cabbie Episode: "Drug Interactions"
2001 Arliss Episode: "As Others See Us"
2002 The Shield Older Armenian Episode: "Blowback"
2002 Gilmore Girls Jesus Episode: "Take the Deviled Eggs..."
2003 Six Feet Under Krikor Hovanessian Episode: "I'm Sorry, I'm Lost"
2003 The Division Episode: "Hearts & Minds"
2003 Boomtown Jewelry Store Owner Episode: "Wannabe"
2004 Line of Fire Zach Episode: "I'm Your Boogie Man"
2006 Boston Legal Mr. Kahanov Episode: "Chitty Chitty Bang Bang"
2006 The Closer Mr. Sarcasian Episode: "To Protect & to Serve"
2006 Saturday Night Live Azamat Bagatov Episode: "Hugh Laurie/Beck"
2007 Ghost Whisperer Jake Rose Episode: "The Collector"
2009 Chuck 'Uncle' Bernie Episode: "Chuck Versus the First Kill"
2011 The Cape Store Owner Episode: "Tarot"
2011 Big Time Rush King of Kerplankistan Episode: "Big Time Wedding"
2012 Chasing the Hill Arnold Sarca Episode: "Awesomeness Is a Warm Gun"
2013 It's Always Sunny in Philadelphia Snyder Episode: "The Gang Broke Dee"
2014 Two and a Half Men Mr. Mardirosian Episode: "Lotta Delis in Little Armenia"
2015 Hawaii Five-0 Omar Sadek Episode: "A Make Kaua"
2018 Cobra Kai Armand Zarkarian Episode: "Counterbalance"
2018 Actress: Another Word for Waitress Giagni Mustavo Episode: "SHOWTIME"
^ Dargis, Manohla (November 3, 2016). "Borat". The New York Times. ^ Abcarian, Robin (February 25, 2007). "Less recognizable with clothes". Los Angeles Times. ^ "Ken Davitian Interview" (in Armenian). Shant TV. July 5, 2012. ^ Abrams, Tamar (November 29, 2011). "Borat Catapulted Him to Fame, but Ken Davitian Is Not Azamat". The Huffington Post. ^ Abrams, Tamar (November 29, 2011). "Borat Catapulted Him to Fame, but Ken Davitian Is Not Azamat". The Huffington Post. Retrieved July 10, 2012. ^ Busch, Anita (November 4, 2016). "Orion Pictures Picks up 'Pocket Listing' For Limited Theatrical Release". Deadline. Retrieved November 26, 2016. ^ joe.piasecki@latimes.com, By Joe Piasecki. "Video: Armenian media thrives in Glendale, Burbank area". latimes.com. ^ Abcarian, Robin (January 7, 2011). "Ken Davitian is enjoying, very much, his Hollywood high five". The San Francisco Chronicle. ^ Bellantoni, Cassandra M. (March 6, 2011). "Hot Dog With Tiger Blood Heats Up Sherman Oaks Restaurant". Patch. Retrieved July 11, 2011. Wikimedia Commons has media related to Ken Davitian. This page was last edited on 15 January 2019, at 22:37 (UTC).